frank expression. Purple Candor, innovation and authenticity, represent the two key pillars of our approach. achieve great results with their teams and organisations. ability to help lift teams and organisations to higher levels of success. ​landscape, is your way of working, then we can help you improve your current way of working. Entrepreneur, CIO, leadership coach, management consultant, trainer and facilitator, with over 30 years of experience, Phil Abernathy started Purple Candor to help make every workplace a great productive place to be. He helped set up the 'Agile Academy' in Australia, thus leading the spread of Agile across the industry as a whole. In his own words, "having grown grey and frustrated on traditional methods" in large corporate organisations in the financial services, energy and telecom sectors, Phil understands the structure and discipline needed by large organisations. Marrying this need with Agile's dynamism and Leans's efficiency is the alchemy he brings to organisations. Phil has both hands-on leadership experience and over 18 years of consulting and management experience with blue chip companies in the international arena such as IBM, Shell and Honeywell. He has been practicing and preaching Agile for the last 12 years. He was CIO of Shell Markets Middle East and later founded his own IT services delivery company, Wisdom, in The Netherlands in 1995. He moved to Australia in 2007, worked as a Director in Thoughtworks for a while and then started Purple Candor in 2008. Philip has extensive experience in the difficult areas of Strategy formulation and execution, operational and project excellence, governance and leadership. ​ small fast incremental steps. Purple is the colour of creativity, imagination and good judgement. Candor, also spelt candour, means open, honest and frank expression. 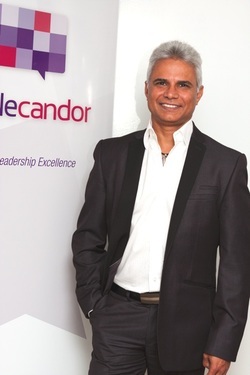 Purple Candor, innovation and authenticity, represent the two key pillars of our approach.